In this inaugural issue of Babble, we prompted our peers to submit a single image of a project (process photo, sketch, finished drawing, or something generally provocative) with a statement on its meaning to them. Simultaneously, we reached out to faculty and visiting critics to establish formal conversations that would unpack the diverse fields of interests that make up our school’s pedagogical approach. 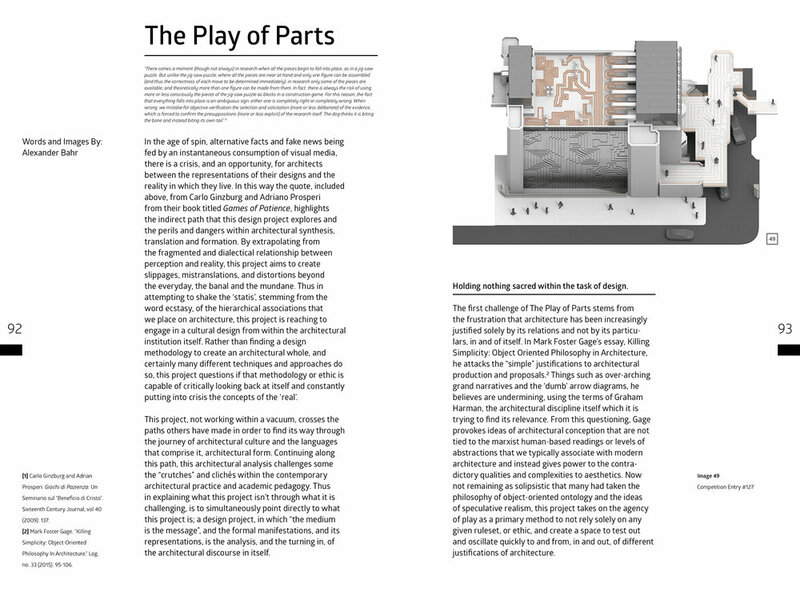 We wanted to unearth the connective tissue that links the work being done at PennDesign with a broader discourse of architecture. In doing so, we took on the challenge of addressing the identity crisis that exists within our school, as a product of these varied pedagogies. While cohesion with a multiplicity of approaches can be challenging to identify, we have tackled this issue through a multimodal approach that allows the medium to be the message. The ‘babbling’ of this first issue takes place between students, practitioners, and academics with varying design interests. From talks on contingency within architecture to the relationship between fiction and function, we started to identify commonalities. What is architecture’s role in the field of idiosyncratic thinkers? What opportunities does engaging with abstraction, subversion, and realism open up for young designers? How do we mitigate variation in an excitingly diverse time in architecture? While it is impossible to fully flesh out and remediate issues of identity in a single publication, the intention behind Babble is to understand a multifaceted approach to architecture that relies on and celebrates the constant feedback loop required to progress design. How we identify ourselves within a global design discourse is reliant on our ability to converse, synthesize, and reposition. Submit up to three images with a brief description of no more than 100 words to be considered for publication in our second issue. With your submissions we hope to hear your thoughts and interpretations on the work going on here at PennDesign. We do not wish to hear about the prompt your professor put forward, we are looking to learn about how you view them through your own lens. Whatever form this may take, be it papers, lists, photographs, film stills, projects, ideas, tips, provocations, critiques, drawings, sketches, manifestos, recipes… we are looking forward to discussing it with you. Our mission is to provide an open platform for the distribution and dissemination of thoughtful and provocative ideas found at a specific moment in time. Babble is more than murmuring, it is an ongoing record of the diverse passions, voices and interests that comprise our school. as students, we are engaged in conversation with our peers, and seek to position this publication as an open platform for developing ideas and voices within the field of design. Secondly, as editors, we seek to synthesize the acquired content to freshly position the diverse opinions and ideas from PennDesign on architectural research and practice into an annual publication. How we theorize, design, and engage in constant feedback loop of conversation as an institution, and within the design field, is the core of Babble’s mission. Babble is a student led and founded publication on architecture from the University of Pennsylvania School Of Design. It serves as a retrospective culmination of the varying pedagogical approaches that our school engages with over the course of the prior academic year; A synthesis of the babbling that exists within our school, distilled and made digestible. Babble provides a look at PennDesign’s diversified approach to architectural making, thinking, and subsequently, practicing, as a broad spectrum of student projects and essays, paired with a focused series of impromptu “babbles” with current critics, faculty, and practitioners. We are open to new opportunities and ideas.